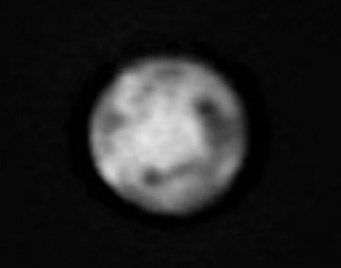 Mars - angular diameter: 14.36" and 98.07% illuminated, April 5. 01:19 UT. The central meridian is 327.1. This is a four frame image stacked by using Frank Sorensens "FITS" program. The air turbulence this morning varied between low and moderate. March 26. 1950 (22:00 UT - estimated). 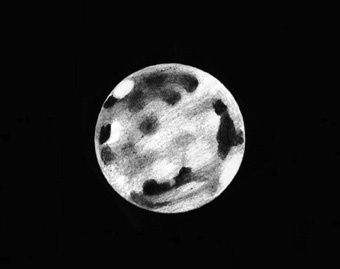 Drawing made by the english amateur astronomer, George Alcock. He used a 4 inch refractor operating at 244 x magnification. The central meridian is close to the one in the CCD image. At the time of observation the planet's declination was 3 degrees north - diameter 14.40 arcseconds. Source: Sky&Telescope, May 1999 - page 86.